He has been described as one of the finest environmental artists in the world. USA Today hailed him as a “Marine Michelangelo”. Ocean Galleries kicked off the summer season with Wyland, the world’s premier ocean artist, when he brought a collection of magnificent sculptures and paintings to the Stone Harbor, NJ gallery for a Memorial Day exhibition. In addition to being an acclaimed painter and sculptor, Wyland is an underwater explorer, photographer, filmmaker, and educator who traveled the farthest reaches of the globe for more than 30 years, capturing the raw power and beauty of the aquatic universe. An ardent conservationist, Wyland’s Foundation is dedicated to promoting, protecting, and preserving the world’s oceans, waterways, and marine life. The acclaimed marine life artist is becoming notorious for leaving the Jersey shore community with much more than expected. Wyland, in town for his Memorial Day art exhibition at Ocean Galleries, kicked off his weekend in Stone Harbor with a tour of the Wetlands Institute, where he fell in love with a juvenile terrapin. 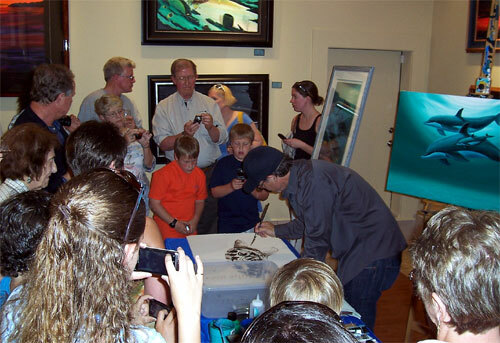 A planned Wetlands fundraiser at Ocean Galleries the following night inspired Wyland to paint his new turtle pal as crowds watched in amazement. The enthusiastic conservationist then auctioned off the painting to raise funding for the organization with a similar mission as his own, keeping the planet and our coastal ecosystem “blue”. When a bidding war ensued, the generous artist agreed to paint a second terrapin image for another happy fan and art collector. Including the initial painting donation of Faster Higher Strong, Wyland and Ocean Galleries raised over $7,600 for the Wetlands. Last summer, Wyland participated in a similar fundraiser for the Marine Mammal Stranding Center in Brigantine, NJ, where he generously donated five paintings in support of the important coastal rescue center, four more than initially promised. 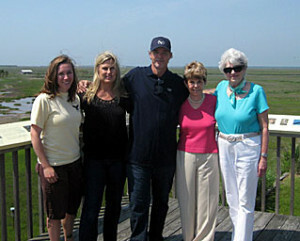 During his visit to NJ, Wyland was enthusiastic to visit the Wetlands Institute. Situated on 6,000 acres of coastal wetlands, the Institute’s mission is to promote appreciation, understanding and stewardship of wetlands and coastal ecosystems through programs in research, education, and conservation. Wyland is pictured with (left to right) Environmental Educator for the Wetlands Institute Kaitlin Gannon, Ocean Galleries owner Kim Miller, Executive Director of the Wetlands Institute Cindy O’Connor, and Sally Herd, long time supporter of and past board member for the Wetlands. The beloved and iconic artist Peter Max wowed crowds at Stone Harbor’s Ocean Galleries for his July fourth weekend art exhibit. 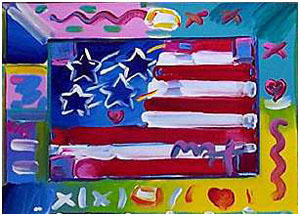 The Salute to Patriotism exhibition included a special fundraiser to support the Comcast-Spectacor Foundation, as well as a local radio station promotion where Peter created a one-of-a-kind album cover painting. Peter’s visit kicked off a month long bidding for an original painting of the 1982-1983 Philadelphia 76ers Championship Basketball Team. Proceeds from the sale of the painting will benefit Comcast-Spectacor Foundation, which is the charitable arm of the Philadelphia-based sports and entertainment firm. The foundation is committed to improving the quality of life in the Greater Philadelphia Region through contributions, donations, player appearances and random gifts of kindness on behalf of the company’s entities, which include the Philadelphia 76ers, the Philadelphia Flyers, Global Spectrum and the Wells Fargo Center. On hand for the event was Emmy-awarding winning sportscaster and official “Voice of the Sixers” Marc Zumoff, who emceed the evening. Max brought several original paintings to the exhibit, including a painting of the famous Beach Boys “Surfer Girl” album, which was part of a radio contest in collaboration with KOOL 98.3. The contest, which asked listeners to vote for their all time favorite cover, was won by Galloway Township resident, Linda Laconey, who was presented the piece by Max himself. Galloway Township, NJ resident Linda Laconey stands proudly next to the Peter Max original painting she won in a KOOL 98.3 radio contest. The piece, replicating the Beach Boys “Surfer Girl” album cover, helped celebrate iconic artist Peter Max’s visit to Stone Harbor’s Ocean Galleries. 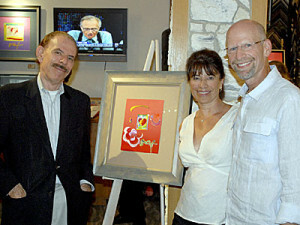 Peter Max personalized and presented the one-of-a-kind painting for Linda and her husband, Bill Laconey. Pop artist Peter Max and Philadelphia 76ers team announcer Marc Zumoff celebrate a fundraising event held at the Stone Harbor location of Ocean Galleries over July fourth weekend. Zumoff emceed the event and talked about the legendary 1982-83 championship basketball team who won the 1982-1983 season. The painting sale will support the Comcast-Spectacor Foundation. Max (far left) is picture with Marc (far right) and his wife, Debbie. 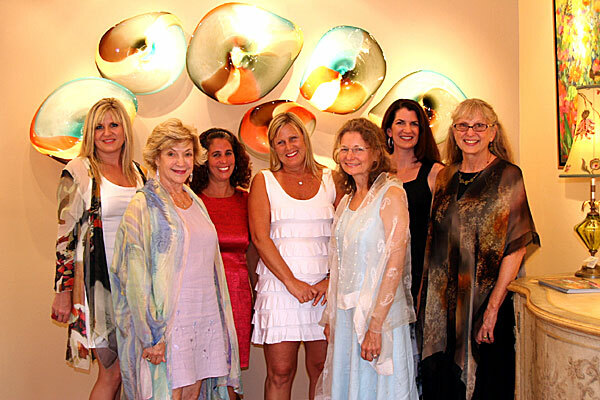 Six celebrated female artists brought magnificent collections of paintings and hand-blown glass to Ocean Galleries this past weekend. 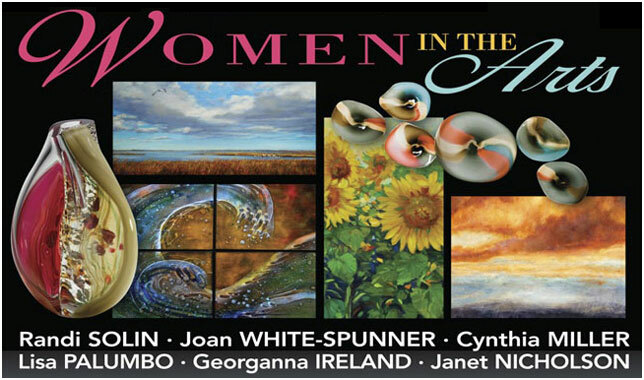 The Women in the Arts exhibit, which was the first gallery exhibition at the Avalon, NJ location, included original paintings and gicleés by Georgeana Ireland, Lisa Palombo, and Joan White-Spunner; as well as extraordinary hand-blown glass pieces by Randi Solin, Janet Nicholson, and Cynthia Miller. 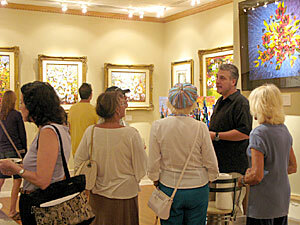 The artists kicked off the weekend long exhibit Friday night with a fundraiser in support of the Avalon Garden Club. The artists donated works of art in support of the organization, which were auctioned off during a Preview Party at Ocean Galleries. 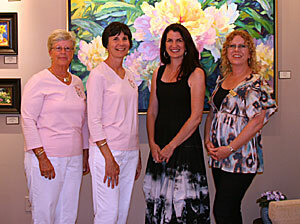 The artists kicked off the weekend long exhibit Friday night with a fundraiser in support of the Avalon Garden Club. The artists donated works of art in support of the organization, which were auctioned off during a Preview Party at Ocean Galleries. Ocean Galleries Co-Owner Kim Miller (center) stands with the six artists featured in The Woman in the Arts exhibit at the Avalon location of the gallery. Pictured (left to right) are Georgeana Ireland, Cynthia Miller, Randi Solin, Kim Miller, Joan White-Spunner, Lisa Palombo, and Janet Nicholson. 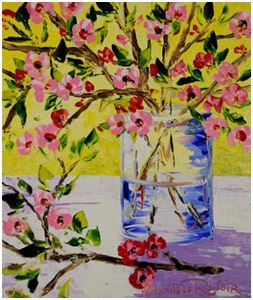 Contemporary American Impressionist Lisa Palombo donated a gicleé to the Avalon Garden Club, a local non-profit organization. Pictured in front of one of Lisa’s paintings are (left to right) Avalon Garden Club volunteer Serena Smith, Avalon Garden Club President Claire Thalman, artist Lisa Palombo, and Ocean Galleries Senior Sales Associate Kristen Venturi. Ocean Galleries hosted beloved palette-knife artist, Howard Behrens for his final gallery show the first weekend in August. The exhibition, The End of an Era: Twilight Memories, included a magnificent collection of new artwork and old favorites. The immensely popular and beloved artist was diagnosed with Parkinson’s disease several years ago, but, amazingly, continues to paint breathtaking artwork in his signature style. 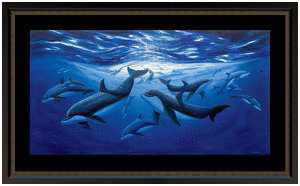 In honor of Behrens final exhibition, Ocean Galleries held a special fundraiser supporting the Michael J. Fox Foundation. A magnificent gicleé, donated by Behrens and framed by Ocean Galleries, raised $3,000 for the non-profit organization dedicated to ensuring the development of better treatments, and ultimately a cure, for Parkinson’s disease through an aggressively funded research agenda. 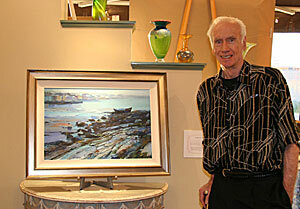 Ocean Galleries hosted a fundraiser supporting the Michael J. 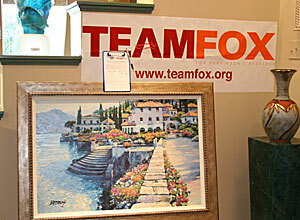 Fox Foundation in honor of artist Howard Behrens, who was diagnosed with the disease a few years back. A magnificent gicleé donated by Behrens and framed by Ocean Galleries, “Stairway to Carlotta”, was on display for silent auction bidding throughout the weekend exhibition. The beautifully framed 24″ x 36″ Limited Edition on canvas was enhanced by Howard Behrens, with a retail value of over $4,500. Historic artwork and the presence of art royalty drew a crowd to Ocean Galleries over Labor Day weekend for the final summer exhibition: Renoir – The Great Grandson’s Homage to the Impressionism Master. The exhibition featured the classic artwork of the Master, Pierre-Auguste Renoir, along with original works and a unique family perspective offered by his great grandson, Alexandre Renoir. 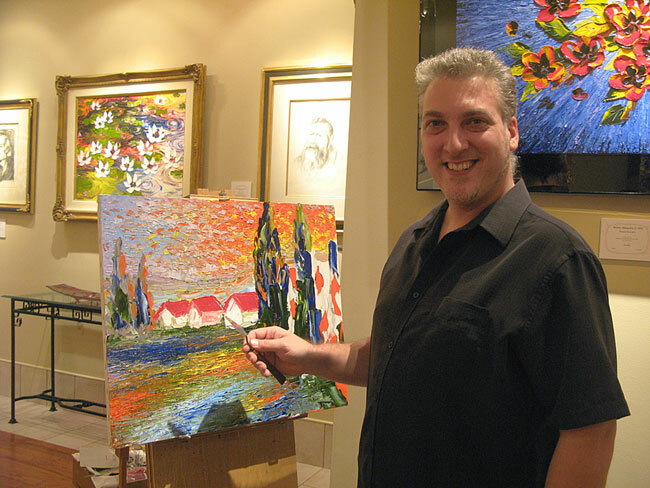 Demonstrating his artistic talents, Alexandre painted numerous exquisite paintings during the weekend event. Along with his brother Emmanuel, Alexandre entertained guests with an insightful perspective of the artwork and the Renoir family. The collection of Impressionistic artwork also included pieces by such greats as Paul Cézanne Camille Pissarro, H. Claude Pissarro, and numerous others. Throughout the Labor Day weekend exhibition at Ocean Galleries, Alexandre Renoir demonstrated his artistic abilities with ongoing painting sessions in the gallery. When Alexandre learned of the Helen L. Diller Vacation Home for Blind Children, he was inspired to create a 16” x 20” original oil painting, which he generously donated to the organization for their first annual Barefoot Ball fundraiser. Alexandre Renoir is pictured beside his vivid countryside painting, which gallery guests adored.